There’s a lot of talk about cloud these days—which one is best (public, private, or hybrid)? What’s the best adoption strategy? How do you handle security? What are the risks and benefits? The pros and cons? And, a big question likely on the minds of a lot of you enterprise execs and IT directors…what are others in my industry doing when it comes to cloud, and is what they’re doing working? Cisco commissioned a report to give us some insight into that last question, and market research firm IDC came through with some big (and some shockingly small) numbers that might surprise you. It turns out, if you’re feeling like your business is not fully optimized for cloud, you’re not alone. Let’s take a closer look at the findings of the report and give you some actionable takeaways to consider. The Cisco-sponsored InfoBrief, titled “Don’t Get Left Behind: The Business of Achieving Greater Cloud Adoption,” was released this summer by IDC. They interviewed 19,080 enterprise director-level and above IT decision makers from across the globe. Of the respondents, over 3,600 reported actively using cloud for multiple workloads. Below are a few facts about those who made up the study sample for this study. I like having this type of methodology information handy, as it can add perspective and context to study results (which we’ll get to in a moment). Twenty-eight percent of respondents were from North America. Thirty-three percent of respondents were from Europe, Middle East and Africa. Fifty-three percent of respondents had a C-level title. Twenty-eight percent of respondents hailed from companies with 1,000-9,999 employees. 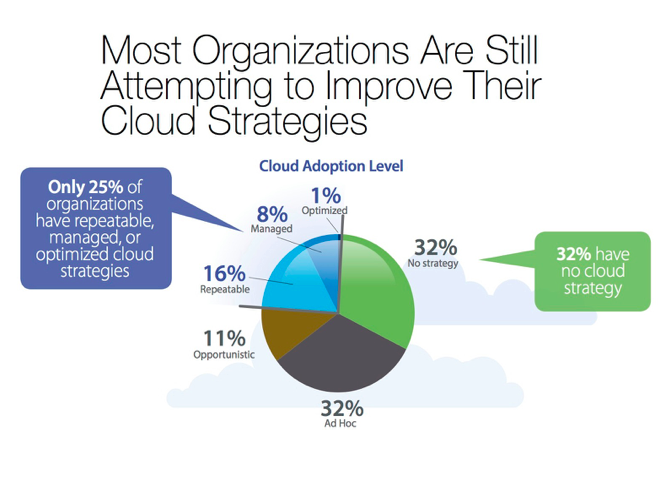 So, just what percentage of the enterprise has a truly optimized cloud adoption strategy? The answer might surprise you: One. Only ONE PERCENT! That’s a shocker, right? Or is it? As cloud becomes more mainstream and widespread across industries, the attitude toward its adoption is changing. The cloud conversation that used to be ‘what can I do with this?’ has become ‘what can I do better with this?’ and ‘where does this fit into my big picture?’ Today, more companies look to cloud as a means to drive better business outcomes—what the study cites as the “second wave” of cloud adoption—but the important strategies needed to get there aren’t exactly clear. Efficiency. Seventy-two percent of respondents said that their cloud adoption efforts had helped them meet client service agreements, and 77 percent said they experienced an IT cost reduction. Speed. Ninety-nine percent of those surveyed reported gains in this area in terms of the time spent provisioning IT services—a telling figure as we talk about cloud’s value proposition. Disruption. This is an uber-important cloud growth driver. Note that those IT leaders surveyed were able to strategically allocate their IT budgets to the tune of a 200 percent growth, all thanks to their cloud efforts. So, wait? All this progress and demonstrated KPI success and only one percent are reportedly optimized fully for cloud? Well, yes, because this is only scratching the surface of cloud’s potential. Fully capitalizing on the investment might involve reevaluating and digging a little deeper. Read on. Point out your gaps in cloud adoption. Recommend products with which to facilitate cloud adoption. Yes, this is Cisco’s baby. So, of course Cisco wants to tell you all about their services—and who would blame them? If you like the free online tool, they’ll happily set up a workshop to discuss options. You can see the independently sourced BCA for yourself and learn more about it by clicking the link. I’m not here to shill for Cisco—you can do whatever you like with the information you gain from the online tool, or you could not use it at all—the main point from this post is to get you thinking about just how optimized you actually are. Are you doing all you can? Where do you fall short? Sometimes, a little fresh perspective can go a long way. 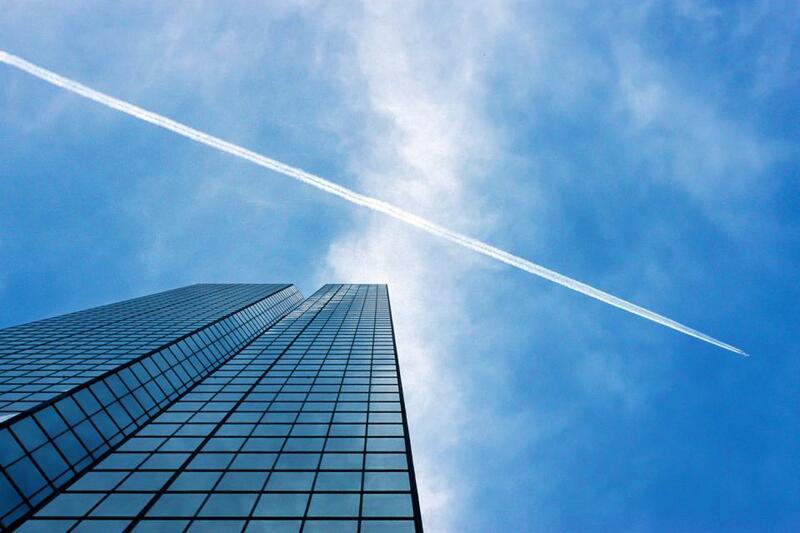 If your business is truly optimized for cloud, that makes you a one-percenter. A one-percenter! So, to wrap this up, tell us—how did you do it? Inquiring minds want to know. How do you continue to keep up with the changing cloud climate? Maybe you’re in “camp buckling down.” If you find your business among the 99 percent who haven’t yet nailed this whole cloud optimization thing, where do you feel you fall? (I hope, for your sake, it’s not in the 32 percent with no strategy at all—but if it is, there’s hope.) Regardless of where you fall on the scale, I’d love to hear what you’ve struggled with thus far and help to celebrate your successes.